Reed Crandall: Illustrator of the Comics by Roger Hill [TwoMorrows Publishing; $49.95] is the definitive biography and examination of one of the great artists in the history of comics. It’s a book you might not realize is vital to the study of comics history until you see it and, having seen it, you won’t be able to imagine not having it in your comics library. Crandall was a masterful illustrator in an era when readers didn’t often see artists as good as he was. If that wasn’t enough, he was also a masterful storyteller. His amazing detailed drawings always served the scripts he worked on. Small wonder he was quickly seen as one of the best in the field and usually commanded the top rate at whatever publisher was lucky enough to have him. 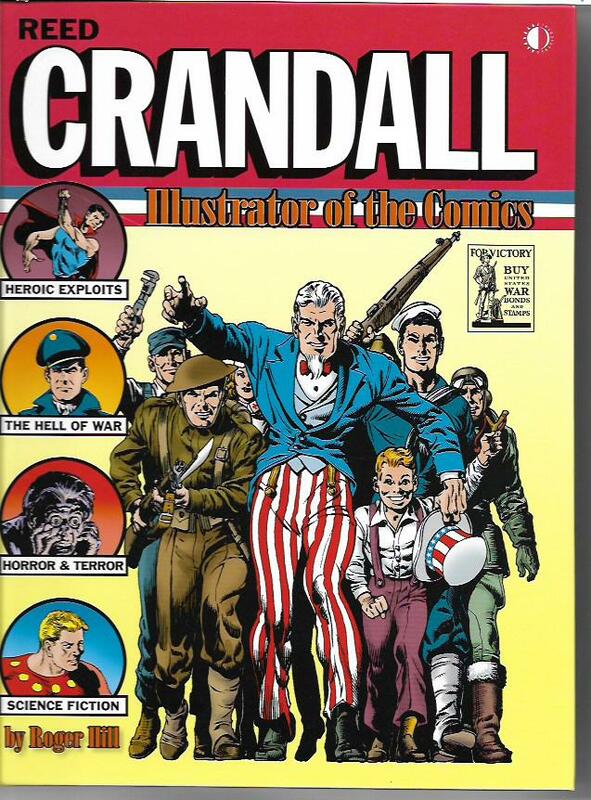 Hill gives us a true biography of Crandall that includes the story of the artist’s family, his schooling, his promise and triumphs as a student, his family/friend/romantic relationships, his fledging entry into the comics field and his swift conquering of that field. On page after page, we see the artistry and genius of Crandall and, with each image, we gain a greater appreciation of just how good he was and how fortunate we comics readers are to have had him doing this work. I was not around to witness Crandall’s legendary work on Blackhawk, Dollman and other 1940s feature, at least not first hand. I have seen some of those comics since and they have never failed to awe me. Good gosh, the man could draw beautiful woman and sleek planes and exotic locations and ordinary objects made large because they were placed in perspective with a doll-sized super-hero. As a kid going to a Catholic school in Cleveland, I saw Crandall’s work in Treasure Chest. The first chapter of an serialized history of communism – “This Godless Communism” – gave me nightmares as he depicted an America in the grip of Soviet dictatorship. Literally. Though Crandall’s art was as circumspect as you would expect in a comic book made specifically for Catholic schools, I had terrifying dreams of priests, nuns, parents and other Catholics crucified on Bosworth Avenue, where my school was located. Though none of his other Treasure Chest work hit me that hard, his realistic drawings on other historical or biographical stories brought other times and places to life. In my teens, I found his work in the Creepy and Eerie magazines I would sneak into my house. MAD Magazine was banned by my parents for many years – they put too much stock in the repressive Catholic newspapers of the era – so I figured Creepy and Eerie would also be unwelcome. But I read and cherished all three magazines. A high school teacher from a school I didn’t attend, but who I knew through comics-reading friends in his classes, introduced me to the EC comics and more Crandall genius. I looked at his work in those and other comics and pictured a man laboring over each assignment, never stopping to sleep or eat more than necessary. Hill portrays a much different artist than in my imaginings, but an artist just as impressive. Crandall loved to draw. It was his core nature and he embraced it. He could and did draw fast, but the quality of his work would never reveal the speed and ease with which he created his masterpieces. He was a modest man, loyal to his friends, dedicated to his craft, and, like so many greats of the 1940s and 1950s, never knowing how much his work was cherished by his readers. But he did know he had the respect of his fellow artists and, later in his life, how much his fans loved him. Reed Crandall: Illustrator of the Comics would be worth owning for this story of this great artist. When you likewise consider all of the wonderful Crandall covers and pages and drawings it includes, it becomes an indispensable volume. It’s my pick of the week and I urge all of you to buy, read and cherish it. When it comes to entertainment, comic books are my first love. But, as my friends and readers know, I also love giant monsters movies. Especially Japanese giant monster movies. 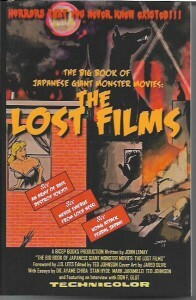 The Big Book of Japanese Giant Monster Movies: The Lost Films by John LeMay [CreateSpace; $16.99] is the author’s third book in a trilogy of titanic terror and the most fascinating of the three volumes. In The Big Book of Japanese Giant Monster Movies: Vol. 1: 1954-1980 and The Big Book of Japanese Giant Monster Movies Vol 2: 1984-2014 [$12.95 each], you’ll find coverage of the movies made and released in those years. However, in this third book, LeMay uncovers dozens of movies that were almost made and even some “fan” films that were made. As big a kaiju fan as I am, I still didn’t know about most of these blockbusters that never were. Nor did I know everything about movies that were made. For example, Gamera  was made to make use of miniature sets built for a disaster/disastrous movie about giant rats called Giant Horde Beast Nezura. The giant rat movie was partially shot in 1963, but cancelled due to the logistical horror of filming actual rats. LeMay’s book is filled with such incredible revelations about film ideas that evolved into very different films when they were actually made. There are stories and monsters that never saw the light of a motion picture screen. The Big Book of Japanese Giant Monster Movies: The Lost Films will astound you. If you have any interest in these movies, and, if so, I embrace you as family, you’ll want this book and the two volumes that preceded it. I recommend them all. Despite its freaky elements, this is an honest-to-gosh love story. No matter how odd the stories got – such as Urabe being the exact twin of a pop idol or their classmates making a movie that echoes their relationship – it was impossible for me not to root for these two kids. The power of their love is inspiring. 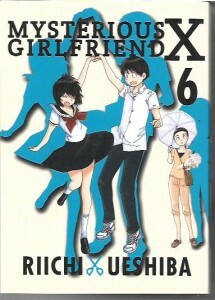 Manga – and especially this manga – isn’t for every comics reader. But, if you want to try something out of your usual reading, check out this series. Yes, it will make you feel a little creepy every now and then, but, mostly, I think it will make you happy.